Tallulah Jane is a small, independent fragrance house in NYC that follows the traditional craft of Bourbon perfumerie, producing small batches made from only the highest quality organic and wildcrafted natural oils - no synthetics, parabens or fillers. Because the scents are entirely natural and handcrafted, there's a degree of uniqueness to each bottle which I think is lovely - you're getting something one of a kind, whose scent was influenced slightly by the weather that year, or the degree of sun on the blooms. 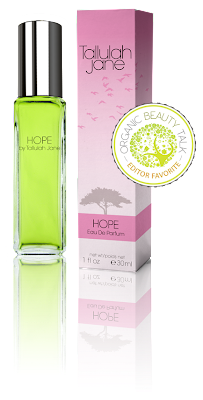 Tallulah Jane was kind enough to send me a lovely little package of their newest fragrance, Hope, an uplifting, sunny scent which donates 50% of all profits to the American Cancer Society. I was extremely suprised to find that the natural oils could produce such nuanced layers, and a distinct drydown - while it's a soft, quiet scent, it's still beautifully and subtly crafted. It opens with the fresh, very natural scent of clementine - not the juicy, acid citrus, but the aromatic oil that's released when you tear open the rind - it's a warm, sunny smell, that gives way to a fresh, bright floral, blending the green scent of white champa leaf with mimosa and jasmine. The jasmine is particularly pleasant because there's none of the sultry, heady wallop so common in fragrances - this is the smell of jasmine creeping up a garden wall or fence, with fresh air and sunshine all around, softly sweet and fragrant. The base has notes of amber, which last nicely on the skin, and ties in very nicely with the citrus - overall, it smells less like a perfume and more like a place, which is what I love in my fragrances - this transports me to a casual California garden, with orange trees and creeping blossoms, and cool green grass underfoot. This isn't going to pry me away from my boozy Guerlains, but I think it's a lovely scent that doesn't shout - a wonderful gift for a young teen as a first fragrance, or someone who likes quiet, distinctive scents. Because of the clementine notes, it actually is quite appropriate for the holidays as well - I'm going to wear it a lot come December when I want to smell that sweet burst of citrus oil that reminds me of opening a Chrismas stocking. And like all the very best scents, it grows on me more each wearing. Hope is available on Tallulah Jane NYC's website for $48 - and you can take a look at their several other unique and handcrafted fragrances that I look forward to trying in the future - Leotie, which is based on meadowflowers - has really caught my eye. The line also includes some gorgeous looking natural bath and body oils - much as I hate to start thinking about the holidays, I'm keeping them on my idea list for luxurious but affordable gifts.